All the jewelry created at Harry Winston today embodies the spirit of the founder who passed away in 1978, but perhaps nothing quite as much as The New York Collection. The 32-piece collection is a tribute to things that held meaning for Mr. Winston in the city. New York sculpted his dynamic character. It is where he was born, where he found so much inspiration and created his legendary jewels. The Winston design team and the master craftsmen who made The New York Collection used an approach similar to Mr. Winston’s during the 1940s, when he conceived the holly wreath setting. Mr. Winston looked at the holiday decoration hanging on his door and recognized it as the perfect analogy for a necklace. The shape of the leaves and berries inspired his layout of marquise, pear and round diamonds and the flexible platinum setting that is virtually hidden under the stones. Winston’s luxurious creation resembled a holly wreath without being too literal. The jewels in the The New York Collection follow the same pattern. Each piece is an artistic hat tip to Mr. Winston’s New York icons, not an exact figurative representation. The Central Park Mosaics bracelet, for example, looks like a bird’s eye view of the gorgeous landscape that inspired Mr. Winston. It is rendered in a pattern of emeralds, sapphires, diamonds and aquamarines. The Eagle earrings featuring diamond wings, that spread over the lobes, reflect the cast iron birds about to take flight near Grand Central Terminal. 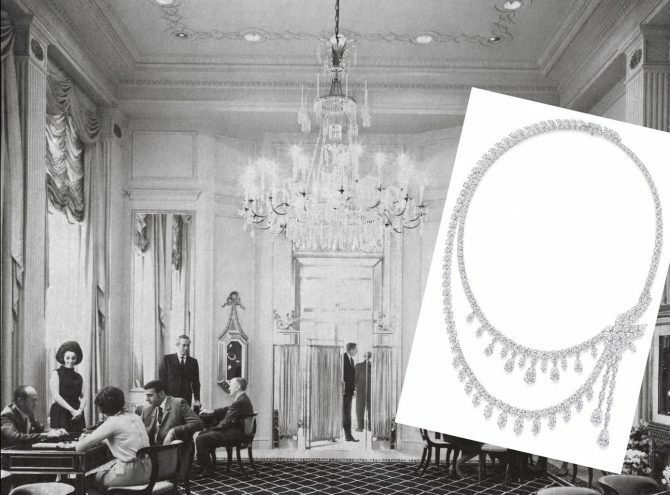 The earrings allude to the romantic first meeting of Harry Winston and his beloved wife Edna on a train trip. The City Lights necklace, worn by Katie Holmes at the launch party for the collection, captures the colors that shine at night on Broadway. It’s a reference to Mr. and Mrs. Winston’s passion for the theater. Rubies, emeralds, sapphires and yellow diamonds twinkle in the white diamond jewel. Several stunning pieces in The New York Collection take design cues from the iconic Winston flagship salon at 718 Fifth Avenue. In 1960 Mr. Winston moved his business into the five-story townhouse situated on the corner of 56th Street after he fully renovated the building into a glamorous boutique. The exterior was remodeled in an 18th century-mode with a façade of travertine and picture windows. The jewel box interior décor has several exquisite and now signature design details. The dramatic black and white marble marquetry covering the entryway provided a sort of blueprint to the graphically patterned 718 Marble Marquetry necklace. 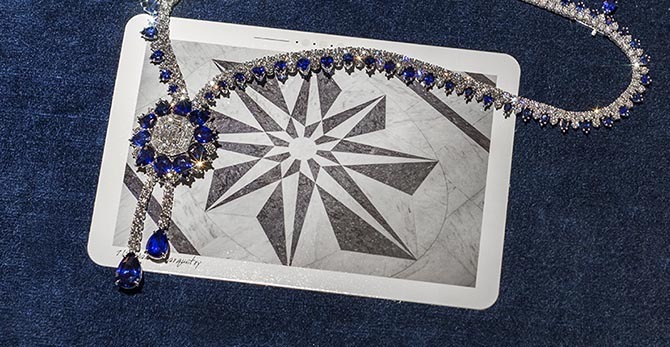 The gorgeous gems in the jewel include a 2.77 carat emerald-cut diamond center stone with 69 pear shaped sapphires weighing a total of 48.53 carats and 204 baguette and round brilliant diamonds weighing a total of 35.57 carats, set in platinum. 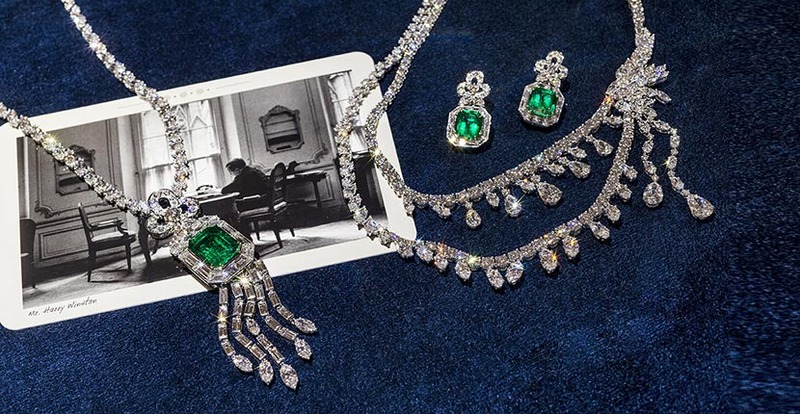 The custom wall vitrines created in the outline of an emerald-cut, Mr. Winston’s favorite gem shape, inspired the 718 Vitrine Necklace set with a 16.63 carat emerald-cut Colombian emerald. The gold tone frames with graceful bows that sweep above the display cases are echoed in the jewel in diamonds. The exact number of diamonds in the jewel are 152 baguette, marquise, trapezoid and round brilliants weighing a total of 53.14 carats. See more of the 32 pieces in the New York Collection on HarryWinston.com. 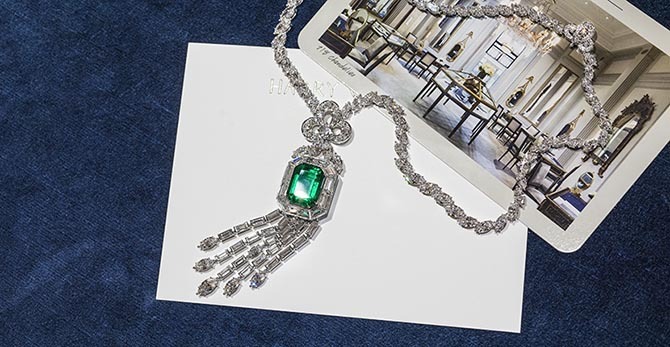 The one-of-kind jewels will be on tour at various Harry Winston boutiques internationally. During October, they will be in Japan. In November the jewels travel to Shanghai. In December they will be back in the United States. Contact Harry Winston for further details or to schedule an appointment for a private viewing.